A retro pixel art game developed by the independent studio Askiisoft. The title is a combination of platform game and a dynamic action game. Katana ZERO takes place in a city full of contrast, during the eighties’ of twenty century. 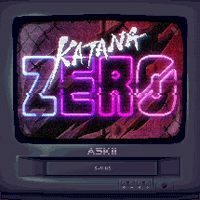 Katana ZERO is a hybrid of a platform game and a dynamical action game. It is the first title developed by independent studio Askiisoft. The PC version of the title was published by Adult Swim Games, a company that also released titles like Volgarr the Viking, Death’s Gambit and HeadLander. Katana ZERO takes place in a city full of contrasts, during the 1980s. The metropolis is not only filled with night clubs that attract shady people – during the game the player will also visit rich districts, slums and even an old cathedral. The protagonist is a ninja warrior driven by a need for revenge. The titular katana is accompanying him in achieving his goal. Action in Katana ZERO for PC is presented from a side perspective. The gameplay focuses on traveling through linear levels and on fighting encountered enemies. The protagonist has many moves available – he can run very fast, jump on long distances, climb walls, dodge and sneak past enemies. The battles are very fast. The key to victory lies in agility and reflex. In many cases the player will need to use the so-called Chronus – a special drug that enables the ninja protagonist to slow time, for example in order to repel a bullet. Murderous laser traps that can be frequently encountered are an additional threat. The game features high difficulty level and the protagonist can die after a single shot or hit. The two-dimensional graphics of Katana ZERO can be liked – the game features pixel art style enriched with modern special effects. The ninja’s vendetta is accompanied by fast electronic music.